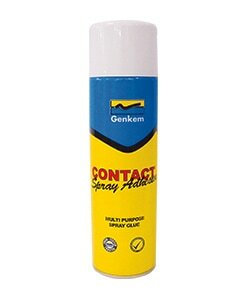 ​Genkem Contact Adhesive is our most popular spray adhesive . It is multi purpose in 300ml cans. ​Great for scrapbooking and mounting photos. This is a professional grade, acid-free adhesive spray that is safe for colour photos, illustrations, maps, and more. Product is clear and forms a permanent bond.